Given Microsoft’s inglorious tradition of promising the Sun and the Moon but ultimately delivering operating systems that are sub-mediocre, bug-ridden and hacker magnets, one might be forgiven for not getting too excited about Windows 10! Now don’t you believe the schmuck hacks and paid flacks who’ll tell you there’s no alternative and that computing Nirvana comes only with Windows 10. Despite the babble from hordes of naysayers, there’s no lack of choice in mobile, desktop and server operating systems. Let’s consider the seven versions of Windows 10 and alternatives for each of them. Targeted at PCs, Tablets and 2 in 1 Tablet PCs, the Home Consumer Edition of Windows 10 features new stuff like the Cortana personal digital assistant, Edge web browser, Continuum tablet mode for touch-capable devices and Windows Hello face-recognition, iris and fingerprint login. With Windows 10 Home Consumer Edition, updates are automatically installed without giving any say to users. What happened to consumer choice or, God forbid, if there are issues with the update? Linux Mint 17.1 Rebecca with Cinnamon or Mate desktop for PCs is a good alternative to Windows 10 Home Consumer Edition. The frequent freezes that used to plague Linux Mint 17 have vanished and you now have a solid consumer friendly operating system that runs well on old hardware too. Linux Mint 17 won’t give you a personal digital assistant but, seriously, how many of us really need such bells and whistles on a PC when there’re plenty of free add-on applications available for Linux. For tablets, I’d recommend you go with iOS, which is the underlying operating system for Apple iPads and iPhones. The huge ecosystem of apps and accessories for iOS cannot be beat anytime soon. Aimed at smartphones and small tablets, Windows 10 Mobile will supposedly run apps built for Windows 10 Home as well as a touch-optimized version of Office. The tall claim is that users can leverage the Continuum feature to use a Windows smartphone like a PC by connecting it to a monitor. I’ll believe it when I see a functioning model. There’s no question that Apple’s iOS operating system running on smartphones and tablets is a slick piece of software offering (mostly) a smooth experience. That’s the reason hundreds of millions of consumers happily pay a premium for for the iPhones and iPads and the humungous choice of apps in the Apple App Store. Google’s mobile OS Android too is getting better. The apps and accessories ecosystem for iOS and Anrdoid is far superior to that of Windows mobile devices. Targeted at small businesses, Windows 10 Pro Desktop Edition is for PCs, tablets and 2-in-1s. The Pro Desktop version comes with extra features like faster access to security updates, support for remote access and controls over update deployment. Ubuntu 14.04 and 15.04, Fedora 22, CentOS 6 and CentOS 7 and Linux Mint 17 are a few alternatives for Windows 10 Pro Desktop edition. On the tablet side, the iPad is a solid alternative. Tens of thousands of small businesses including restaurants, florists and contractors use iPads attached to the Square payment system as point of sale devices. Builds on Windows 10 Pro and targeted at medium and large sized organizations who must pay much more. Windows 10 Enterprise focuses on security, app and device management and flexibility on installing Windows Updates. There’re plenty of alternatives here for Windows 10 Enterprise Edition as well. Let’s consider a few of them – CentOS 6 and CentOS 7, RedHat 6 and RedHat 7, and OS X for starters. Tens of thousands of large enterprises have bet their business on RedHat Linux to run back-end operations and do the heavy lifting. IBM’s recent move to allow employees to pick MacBook Pro or MacBook Air as workstation or notebook replacements will make it the largest “Mac shop” in the enterprise by the end of 2016. Building on Windows 10 Enterprise, this version is geared toward school staff, administrators, teachers and students. Microsoft intends to offer this edition through academic Volume Licensing, and provide paths (for a fee???) for schools and students using Windows 10 Home and Windows 10 Pro devices to upgrade to Windows 10 Education. Dell offers a bunch of Inspiron 15 3000 Series laptops running Ubuntu 14.04 that seems just right for schools and students. These Dell systems are low-cost computers that are ideal for resource constrained schools. Pricing for the Dell Inspiron 15 3000 Series notebooks starts at $250. Windows 10 IoT Core is aimed at small footprint, low cost devices like gateways. 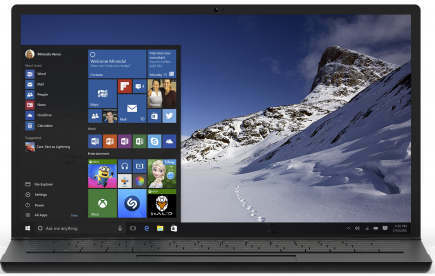 You can be sure it’ll be a long time before Windows 10 makes headway in the embedded market. Linux has long been used as an embedded OS in small form devices like routers, set-box boxes, gateways, industrial automation and machine control. It’s no exaggeration to say that there are already hundreds of millions of small devices running an embedded version of Linux. Targeted at large businesses that have deployed smartphones and small tablets, Windows 10 Mobile Enterprise has a focus on security and device management and assures users flexibility in deploying updates. Again, I’d recommend Apple iOS or Google’s Android for mobile enterprise customers. IBM, major airlines (American Airlines and Alaska Airlines are using iPad tablets in cockpits) and scores of other large enterprises have already demonstrated their confidence in the iOS platform. Folks, ignore all the noise about Windows 10 being the fastest path to Heaven! There’s enough choice out there to Windows 10 both in the consumer realm and enterprise arena, if you’d only look.